YouTube Content Strategy is very important for Building a YouTube Brand. We all know how brands and marketers give prior importance to the YouTube platform in marketing and advertising. Because YouTube can boost the search results and improve the rankings and thus develop the business with good exposure to the right audience. However, still, many marketers are failed to reach their potential audience though they have included YouTube marketing in their strategy. It is because the lack of solid YouTube strategy that fit for your marketing ecosystem. 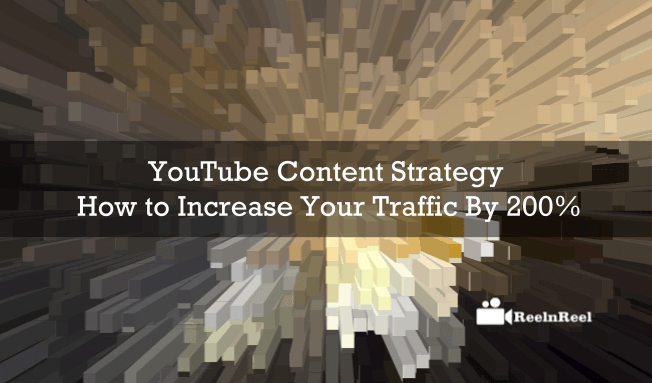 So, here is the best guide for YouTube content strategy which can help you to increase traffic by 200%. It helps you to fetch good results. Brainstorm and plan ahead your YouTube strategic plan by focusing on your primary objective behind the YouTube advertising and marketing. Always focus on your key requirements that are essential for your business or promotion of your brand. There is a lot to do in YouTube advertising and marketing, and everything must be there in your content strategy to boost your traffic. Your content strategy must cover from the YouTube channel design to optimization of your channel across the platform. Each and every step must be placed in your plan and have to execute in a better way that fit your idea. Content plays a significant role in your overall success as it is the key element that can fetch you success and encourage your audience towards your content. Content can help you to reach the right audience and convey the message you want to share. It is the key element that can bring your business conversions by improving the conversation between the brand and audience. Producing specific issues plays a crucial role in YouTube content marketing. Your topics must be trendy, catchy and useful to everyone. Then only your channel can fetch good results. Apart from getting the topics by researching the web, you can also create your topics that are trending and interesting to the audience. Before creating your topics do not forget to be and think like an audience. If you can think like audience then only you can get the best topics which can keep your audience more interesting to watch your videos on YouTube. So, create your topics instead of choosing some regular trending topics and topics from the topic generators. By following this, you can get closer to your audience. Quality is everything here in success. For example, if you search for a video and clicked on another one as you think it was something interesting by seeing its title. However, after playing the same video, you might cut your interest if it shot with a cheap camera and low-quality audio. So, you just need good quality equipment while you decide to produce best video content on your purpose. Then the only audience can get connected with your videos and will become potential followers to your channel. Produce the best quality unique content to stay out of the millions of videos on the platform. Make your mark with creativity in approaching the audience. Before producing the videos in your niche, you must do some research on your audience on their viewing habits and interests. Basing on their interest in a particular category or area, you must produce something different and engaging to the audience. Engaging content is nothing but a content which can raise interest in the audience to watch and follow regularly. So, to deliver such type of content, you need good in-depth research on audience interests and ability to produce unique content. If something went viral across the web, we all used to search for the similar topics and things in a search engine to find out new and more on the same thing. It is the general human behavior, so utilize the same to boost your traffic. Use the trending keywords that match your niche and content and place them well in your video description and titles. So, that while people are searching for the relevant content, your video can have more chances to exposé at the top results. So you can boost the traffic towards your channel. You can also utilize the keyword optimization services for better optimizing across search engines to improve the visibility and ranking. Your content must be shareable across the social media platforms, and you need to provide an ease of sharing your content for your audience. People love to share the best of the content they gen rally watch on YouTube, so why not your content can be the most shareable one. Yes, so get an active social signal and specialize with the people. Make good online presence on different social networks and engage with the audience with your content. Cross-promote your content on a different platform where your fans are sharing your content. Don’t leave them alone on multiple platforms. Maintain official accounts on Facebook, Twitter, Instagram, Pinterest, etc. and interact with the audience by conducting audience polls and take their suggestions using the live sessions. Your content must not be boring one to the audience. For example, if there are some thousand of videos on how to make a tea, you must fetch something different in making a tea which can create more interest in your audience instead of only make a cup of tea. That is called storytelling; the way of storytelling can enhance your traffic towards your channel. So, always make your audience at the centre of your storytelling and let them know how important they are to your channel. Your content must deliver a feel for the fresh content and the content which is new and different. That impact must be delivered to your audience. Finally, follow these above simple ideas to make a better YouTube content marketing strategy and fetch good traffic to your YouTube channel by 200%.